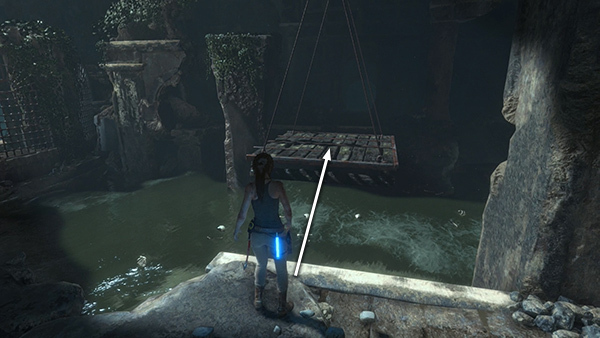 Like the water puzzle in the previous area, this one requires you to raise the water level in several stages. 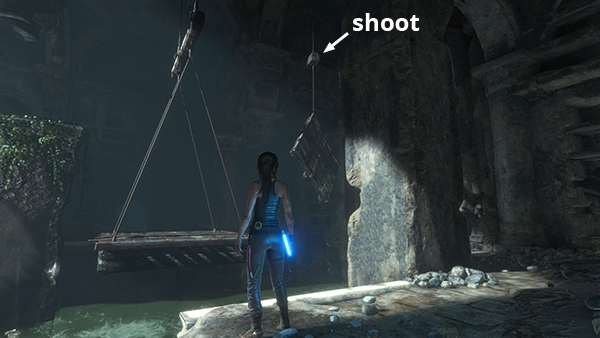 Start by jumping onto the dangling platform and from there to the ledge on the other side of the room. 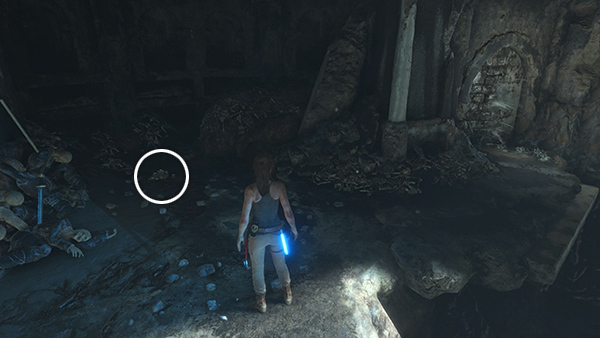 Pick up the pile of 2 coins lying on the floor directly ahead. 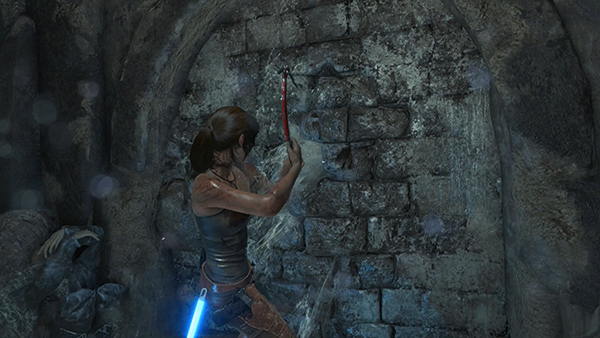 Then move to the right and use your axe to destroy the crumbling wall, letting in a torrent of water. 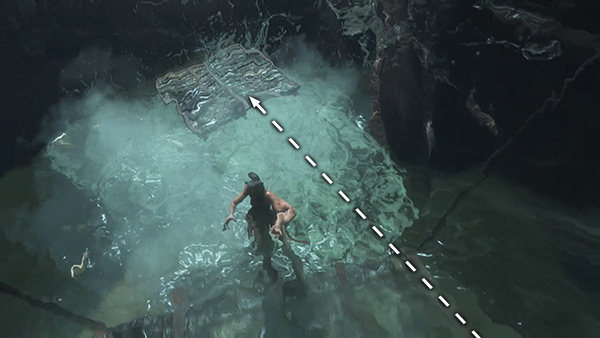 This raises the water level in the pool but not enough. 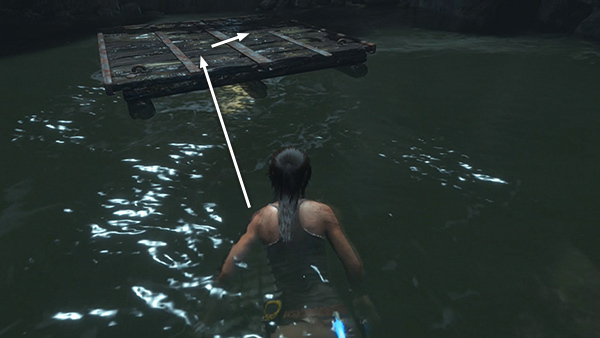 Shoot the small block holding up the wooden pallet so it falls into the pool. 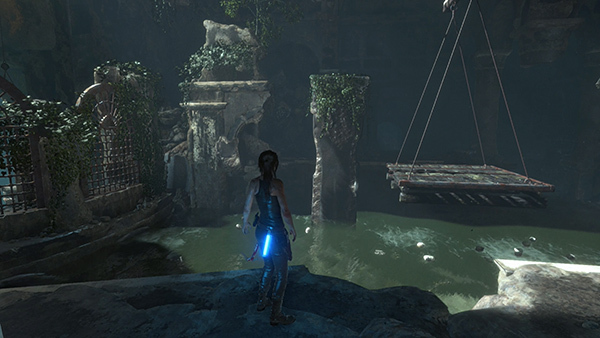 Then jump onto the dangling platform. 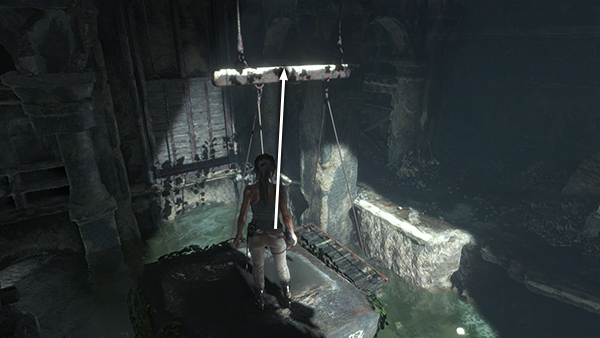 Lara's weight raises the sluice gate, and the rushing water propels the wooden pallet across the surface of the pool to the left. 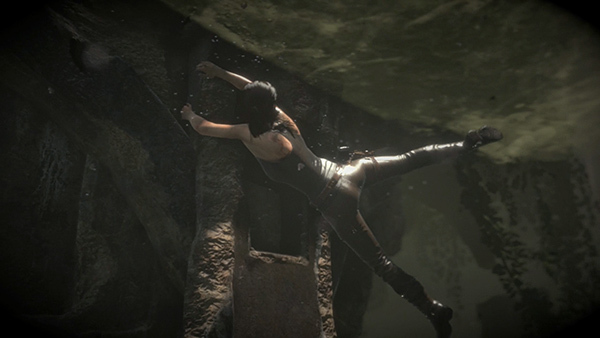 But as the platform where Lara is standing sinks below the surface, she can no longer keep her footing. ...jump toward the column with the vertical scuff marks, and scramble up it to grab the handhold. 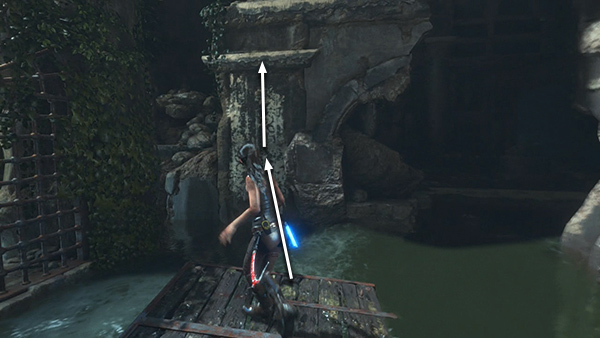 If you miss, the platform and sluice gate reset, so you'll need to swim to the corner to the left of the sluice gate, climb back up to the ledge and try again. 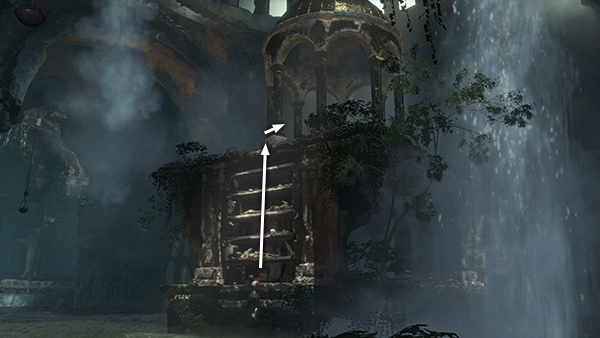 Once you make it to the column, climb to the upper handhold then jump to grab the next column to the right. Climb on top of it. 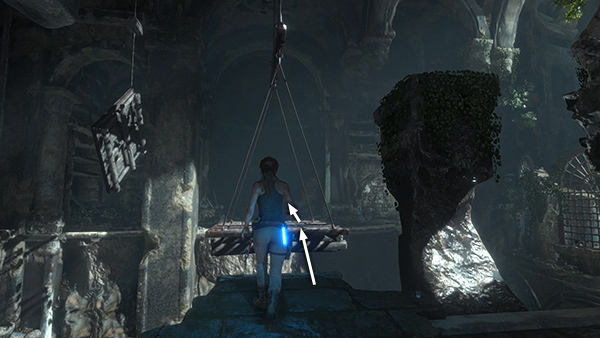 Then jump to grab the wooden bar supporting the dangling platform. 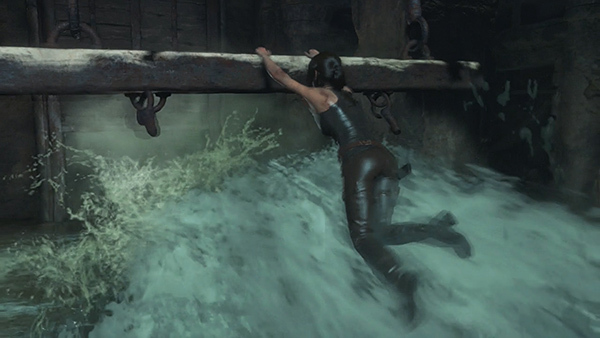 This time, when Lara opens the sluice gate, the water floods in, sweeping her over the edge into the room below. ...and when the water recedes, she's sitting pretty about halfway up the gilded tower. 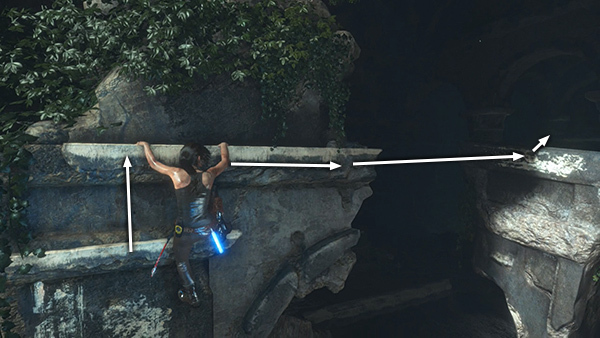 Climb to the top to trigger a cutscene.